Three banks have separated themselves from the pack since the onset of the financial crisis. The past decade has been a challenge for banks, given the financial crisis and its aftermath, but one upside is that it's given investors the opportunity to see which of the nation's biggest lenders actually operate in a prudent and profitable manner as opposed to just claiming to do so. With respect to the nation's largest banks, three in particular have separated themselves from the pack: Wells Fargo (NYSE:WFC), PNC Financial (NYSE:PNC), and U.S. Bancorp (NYSE:USB). 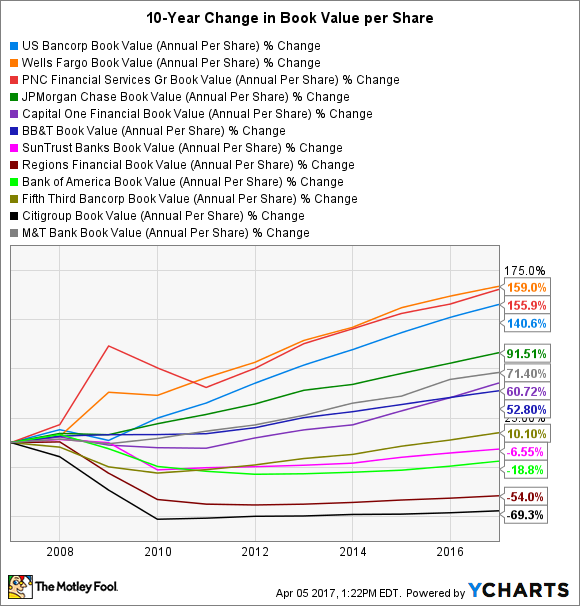 Wells Fargo led the way, with a 159% increase in its book value per share since the beginning of 2007. PNC Financial came in second, with a 156% increase. And U.S. Bancorp rounded out the top three, with a 141% boost to its book value per share over the past decade. By comparison, the average bank in their peer group saw its book value per share climb by only 38%. And if you exclude these three banks, the peer group average drops to only 6%. USB Book Value (Annual Per Share) data by YCharts. What is it about these three banks that enabled them to so handily outperform their peers? The answer is twofold. First, Wells Fargo, PNC Financial, and U.S. Bancorp are three of the most efficient banks in the industry. Last year, their efficiency ratios, which measure the percent of revenue consumed by operating expenses, all came in below the standard industry benchmark of 60%, with PNC Financial leading all big banks with a 52.5% GAAP efficiency ratio in 2016. A low efficiency ratio is important because it means that a larger share of a bank's top line is available to fall to the bottom line and thereby bolster book value. It's also important because a highly efficient bank has less incentive to take shortcuts, like reducing credit standards in order to increase loan volumes, in an effort to improve profitability. Because of our prudent lending to customers with less than prime credit and our decision not to make negative amortization loans, we estimate we lost between two and four percent in mortgage origination market share from 2004 to 2006. That translates into losing between $60 billion and $120 billion in mortgage originations in 2006 alone. Wells Fargo hasn't since done itself any favors, as it was revealed last September that thousands of its employees opened millions of fake accounts for customers who either didn't know about the accounts or didn't want them in the first place. But the fact remains that the California-based bank proved through the financial crisis that it knows how to manage credit risk. For investors interested in bank stocks, in turn, these three banks are a great place to begin your search. They all trade for high valuations, but the peace of mind and downside protection they seem to offer goes a long way toward earning the added premium on their share prices.